First glass jewelry date back to prehistoric times and was carved from a glassy volcanic rock called Obsidian. Jewelry made from glass produced by humans appear 3000 BC. Product glass is not transparent, it will be 1500 years. Blown glass technique appears in the 1st century BC and revolutionize the glass industry. Murano glass takes its origins in Venice whose glass production probably dates to the Roman empire. In the 11th century, the Venetian glassworks are moved on the island of Murano. The fame of Murano glass began in the 13th and continued the following centuries. 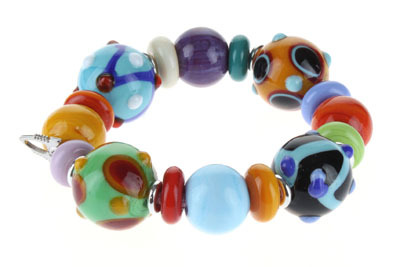 In the 17th century, Murano glass was strongly challenged by the Bohemian crystal. Jewellery glass crossed time from prehistory to today through Egypt and the renaissance. The techniques discovered over the centuries make glass material of the most sought-after by the creators of jewelry.